Thanks to the generosity of generations of Seeing Eye supporters, we are able to support our administrative and fundraising expenses through the earnings on our unrestricted financial endowment. Thus, you can be sure that 100% of your contribution will be devoted to our programs, directly supporting the breeding, raising and training of Seeing Eye® dogs and instructing people who are blind and visually impaired in their use and care. The Seeing Eye receives no government funding and is supported entirely by individual, foundation and corporate donations and grants. Without you, we simply couldn’t create the inspiring human/canine partnerships that change lives. Double or Triple Your Gift! 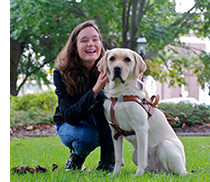 Check to see if your employer has an employee matching gift program to increase your gift to The Seeing Eye. The Seeing Eye, Inc. is a registered United States nonprofit under IRS section 501(c)(3). Your contribution may be tax deductible on taxes paid to the United States. Consult your tax adviser. The Heritage Society: I have included The Seeing Eye in my will or estate plans. If you donate and have not already registered, you will receive periodic updates and communications from The Seeing Eye. Help Pave the Path to Independence! With a gift of $250 or more, you can personalize a commemorative engraved brick. Click here for more information. Please contact Deborah Morrone-Colella, Director of Donor and Public Relations, at dmorrone-colella@seeingeye.org for more information on how you can be part of our Blueprint for the Future!